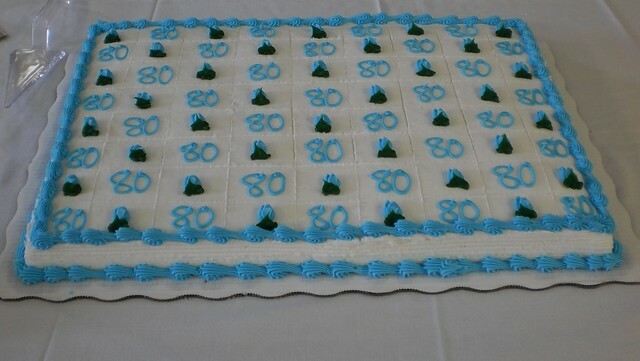 Dale actually turned 80 on the 4th but a celebration was held on the 6th. This involved a catered dinner for all the family and then an open house with cake and punch. I didn't count how many of us there were at the dinner but we filled the middle tables and spilled over to the side tables. That's a lot of relatives. We had prime rib, pork loin, smashed potatoes, 7-layer salad, broccoli cauliflower salad, rolls and green beans. Of course, there was a lot left over. I have a chunk of pork loin in my fridge waiting for supper tonight. I'm thinking french fries and corn for one meal and pork and beans with jello (gotta make jello tonight) for another meal. It was really good. Whomever this "Tony" is that everyone knows does an exceptional job of catering. Oh my was there cake. I think they had 4 sheet cakes. Mom and Dale have a full sheet cake in the freezer. We will work on it at Thanksgiving and again at Christmas. We cleaned up after our dinner and prepared for the public. My family sat in a group on one side of the room. We don't know any people here other than Dale's family and we really don't "know" them to socialize. We played Apples to Apples until it got too loud in the hall to hear. I'm going to hazard a guess and say the open house part of the event was the best part, for Dale. Yes, having all the kids and grandkids and great-grandkids together was special for him, but the hall was packed with people about 3:30 p.m.
For Walker, Iowa, it wasn't just a chance to drop in and wish Dale a happy birthday, it was a chance to see people. It was not a fundraiser. No one would come around with a can for change. It was a chance to have cake and coffee and talk to that person you may not have talked to in a few years. 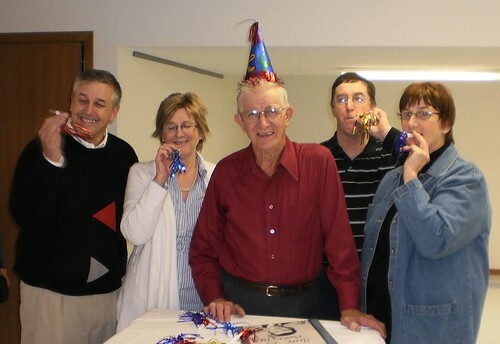 As Dale sat at the kitchen table later that evening opening his birthday cards, he kept remarking on who had shown up. "It was so good to see x. He's not been well and I haven't seen him in a couple of years." I think that's what's different about small town life. You know everyone. Whether that's good or bad is debatable, but you know them and they know you. These kinds of events bring people out. It's a chance to reconnect that meeting at the bank does not. There is the built in sociability, the built in camaraderie of a shared celebration. 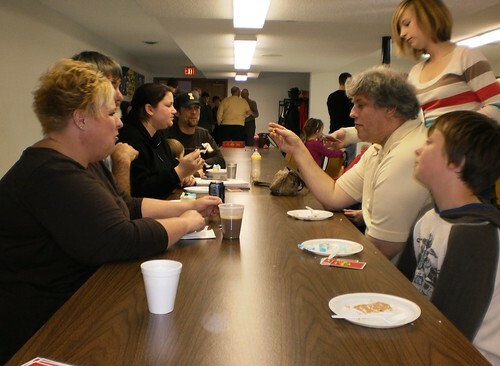 People come to festivals or chili suppers, but it's not quite the same as this. And you certainly won't get this in the 'big city'. As much as we crave friendships, it's a lot of work to do it in person. At an event like this, it's easy to be sociable, even if you're not the most personable because you are sharing the celebration. "How do you know Dale?" I didn't get up a whole lot. It was tough. But it was a great event to sit and people watch. Even in a small town, where everyone knows everyone, people live singular lives. It can be hard to get out of your comfort zone and reach out to others. An event like this forces people to do just that. The results were exciting. In the end, it was a celebration of one person. Dale said later he was incredibly humbled by how many people took time out of their day and their football games, to come say hello, have cake and spend a few minutes talking to all these other people. The event ended at 4:30 and we cleaned up. Dale's kids made him wear the hat and we all blew the noisemakers. We also all agreed that had we blown the noisemakers when all those people were in the church hall, we'd all be saying, "Eh? What? I can't hear you?" It was a great event. I'm very glad I made the trek.